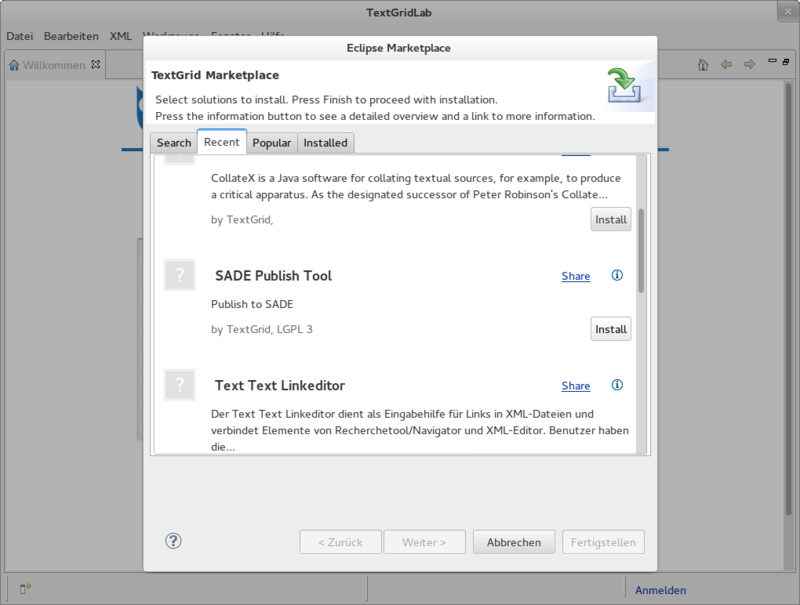 Within the TextGridLab the SADE Publish-Plugin is needed for tranferring data to SADE easly. It is available via the Marketplace. After the installation process is done, the plugin needs a pointer to a SADE server. Add the configuration via menu "Window" -> "Preferences"
To publish data from the Lab to a SADE instance the SADE server must be up and running. If this is not the case so far, please start the server with start.jar (Windows) or bash bin/startup.sh. hit [CTRL] + 3 and type SADE and select SADE Perspective from the list. When using the Navigator's context menu entry Publish to SADE when the tool is not active, the item to be published will not be recognized by the Publisher. You have to repeat the selection. A context menu entry is added to the Navigator. 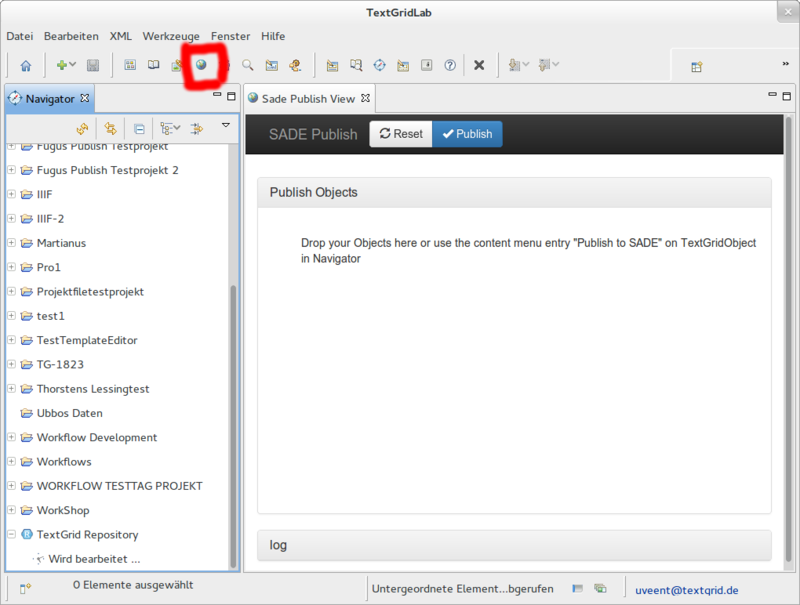 So you can right-click on the item you want to publish and select Publish to SADE. By holding [CTRL] or [Shift] you can select multiple items. Linux and Mac users can also take advantage of a drag'n'drop feature. Simply drop the items you want to publish at the central space within the publishers view. When an aggregation is added to the Publisher, its content (and all of its content) will be sent to SADE. Click on the "Publish" button. Successfully transferred items will be highlighted green. The "Log" contains all information to the process. All published items can be found in the database at /db/apps/sade/textgrid/, depending on which kind of object you have published. Published XML files are available at http://your-server/exist/apps/sade/textgrid:$URI. The leading virtual research environment provides outstanding services for the humanities. Get in touch and join us! TextGrid 2019. All rights reversed.